Clinically: 60 y o male with right side painful eye movement, ptosis. MRI Brain with MR Angiography was normal. 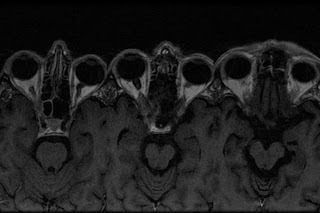 MRI Orbit shows an abnormal ill defined enhancing soft tissue at right orbital apex, obliterating superior orbital fissure, involving superior rectus muscle which is bulky show high signal on STIR. Mild right orbital proptosis. No obvious osseous destruction of CT at orbital apex. Minimal adjacent sphenoid sinus mucosal thickening. Specimen : Right orbital mass. Gross Appearance : The specimen consists of dull grey soft to firm pieces together measuring 0.3X0.3X0.3 cm. The entire specimen is submitted for processing. Microscopy : The section shows striated muscle and fibrofatty tissue along with a couple of pieces of (undecalcified) bone. The fibrofatty tissue shows minimal lymphocytic infiltration. The muscle shows considerable degenerative changes however, and consists of fragmented fibers, sarcolemmal nuclear proliferation with mild fibrosis and lymphocytic infiltration. There are no granulomas seen. Deeper sections show similar appearance. Final Diagnosis : Chronic inflammation with degenerative changes in muscle ? inflammatory pseudotumor.